Matt is launching this new tourism venture with an all-inclusive activity and accommodation package the Wetland Safari Camp – Overnight Tour which he explains is for people wanting to experience the best of the outback without sacrificing comfort at the end of the day. 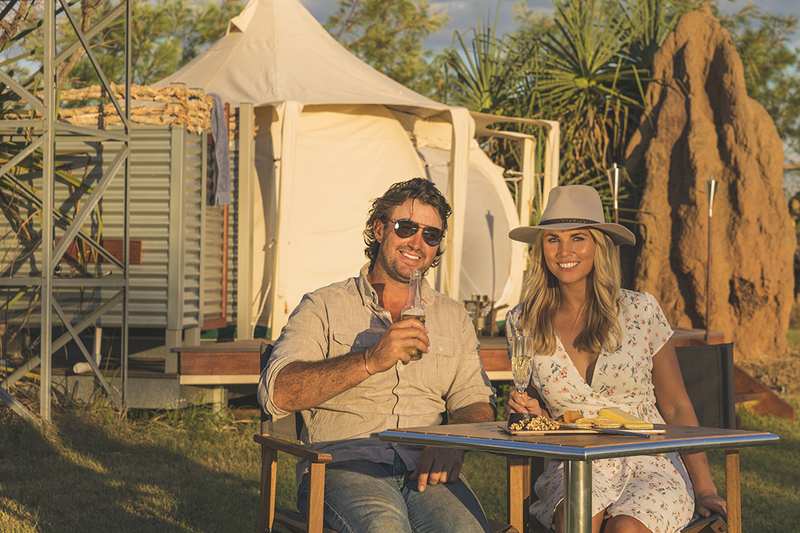 “This is a fun and authentic outback experience with the added luxury of not having to share a small flimsy tent on a blowup mattress – we’ve got comfy double beds, good tucker and a great setting. Located one hour southwest of Darwin, the camp’s surrounds are a beauty to behold teeming with wildlife and untouched landscapes. Upon arrival, guests are transferred to a custom built airboat to start their journey deep into the rainforest to encounter some of Territory’s most unique wildlife, including saltwater crocodiles, buffalo, wild boars and a range of bird species. After seeing wildlife up close and personal, guests get to experience the thrill of airboat fast laps and helicopter joy flights in a Robinson 44 helicopter high in the sky. After a fun filled afternoon on the water a helicopter transfers guests back to the camp for an outback dinner in style. Guests can freshen up in their private outdoor shower and unwind on the deck of their tent with a complimentary cheese board and drink before making their way to the communal Star Deck for drinks and dinner. As the night falls and stars fill the sky, the welcoming staff make guests feel at home as they prepare a gourmet Australian BBQ of beef, barramundi, damper rolls and salads. After this unique dining experience, guests can relax knowing they’ll be resting their head in the comfort and style of a Lotus Belle Tent. Guests rise and shine early the next morning for a cooked breakfast on the deck before boarding the bus back to Darwin. This all-inclusive package starts at $725 per person and includes airboat adventures, helicopter joy flights, gourmet meals and one-night accommodation. For more information and to make a booking visit mattwright.com.au or call 08 89814881.